In October 2003, the summit meeting of the heads of government of the Association of Southeast Asian Nations (ASEAN) issued a major statement that declared, “[a]n ASEAN Community shall be established comprising three pillars, namely political and security cooperation, economic cooperation, and socio-cultural cooperation…”1 Each successive ASEAN Summit and Annual Ministerial Meeting (AMM) of foreign ministers has advanced this goal. It was expected that the 45th AMM, held under the motto “ASEAN: One Community, One Destiny,” would follow its predecessors by adopting further measures to make the ASEAN Community a reality. As events transpired, differences among ASEAN states over how to manage territorial disputes in the South China Sea emerged as a litmus test of their ability to achieve an ASEAN Political-Security Community by 2015. This article is divided into five parts. The first part briefly presents the historical background to the evolution of ASEAN’s policy on a Code of Conduct in the South China Sea. It then sharpens the discussion by comparing the Philippine Working Draft, Philippines Draft Code of Conduct drawn up in early 2012 with ASEAN’s Proposed Elements of a Regional Code of Conduct in the South China Sea approved by the 45th AMM in July. Part two examines internal discussions by ASEAN foreign ministers at their 45th AMM Retreat. These discussions reveal the issues that prevented the foreign ministers from reaching consensus on the wording of a single paragraph on the South China Sea and the unprecedented decision by the ASEAN Chair to withhold issuing the customary joint communiqué. Part three details the public recriminations that followed, while part four discusses Indonesia’s shuttle diplomacy to restore ASEAN unity. Part five offers an evaluation of the implications of these developments for ASEAN unity, the prospects for an ASEAN-China COC, and an ASEAN Political-Security Community. The DOC was stillborn. It took a further twenty-five months before senior officials reached agreement on the terms of reference for the ASEAN-China Joint Working Group (JWC) to implement the DOC.7 In August 2005, ASEAN tabled draft Guidelines to Implement the DOC at the first meeting of the JWC. Point two called for ASEAN consultations prior to meeting with China.8 China objected and repeated its long-held position that the relevant parties should resolve sovereignty and jurisdictional disputes bilaterally. This proved such a sticking point that another six years of intermittent discussions and twenty-one successive drafts were exchanged before final agreement was reached. In July 2011, the Guidelines to Implement the DOC were adopted after ASEAN dropped its insistence on prior consultation and agreed instead to promote dialogue and consultation among the parties. A new point was added to the Guidelines specifying that activities and projects carried out under the DOC should be reported to the ASEAN-China Ministerial Meeting.9 All the other points in the 2011 Guidelines remained unchanged from the original ASEAN draft tabled in 2005. ASEAN and Chinese senior officials commenced discussions on the implementation of the Guidelines. At a meeting held in Beijing from January 13-15, 2012, agreement was reached to set up four expert committees on maritime scientific research, environmental protection, search and rescue, and transnational crime. These committees were derived from the five cooperative activities mentioned in the 2002 DOC. Significantly no expert committee on safety of navigation and communication at sea was established due to its contentious nature. Article I of the ASEAN draft COC contained its operative provisions and called on the parties to “respect and adhere to the United Nations Charter, 1982 UNCLOS, Treaty of Amity and Cooperation in Southeast Asia, DOC and the Five Principles of Peaceful Co-existence. However, five of the principles contained in the Philippine draft were deleted in their entirety: respect for freedom of navigation and over flight; the need to define, clarify and segregate disputed areas from the non-disputed areas; full resolution of the territorial and jurisdictional disputes; refrain from undertaking activities that may disrupt the peace and endanger the environment; and build trust and confidence on the basis of equality and mutual respect. The ASEAN draft contained four principles: (1) to “develop modalities and arrangements for the promotion of settlement by peaceful means of disputes and prevent their escalation…;” (2) to respect the provisions of and take actions consistent with the COC; (3) to encourage other countries to respect the purposes and principles contained in the COC; and (4) to establish an effective mechanism to monitor the implementation of the COC. Article III(4) required signatories to “establish a mechanism for settling disputes relating to the interpretation and application of the Code of Conduct.” The ASEAN draft, following deletion of any mention of the joint cooperation area, also dropped reference to a dispute settlement mechanism in the joint cooperation area. In the event that parties are unable to resolve their dispute within the ASEAN framework, the ASEAN COC sets out a second mechanism: the disputants “may resort to dispute settlement mechanism provided under international law, including UNCLOS.” This could include taking their case to an international court for adjudication. UNCLOS, however, does not contain any provisions for the settlement of sovereignty disputes over islands and rocks. It does provide for an International Tribunal for the Law of the Sea (ITLOS) to adjudicate disputes over maritime jurisdiction.20Under international law “the land dominates the sea” and before disputants can take their case to ITLOS they would first have to determine sovereignty over disputed islands and rocks on which their maritime claims are based. The document, ASEAN’s Proposed Elements of a Regional Code of Conduct in the South China Sea (COC) between ASEAN Member States and the People’s Republic of China, has not been officially released and remains an internal draft ASEAN document. At the 45th AMM Retreat Marty Natalegawa promised that “Indonesia will circulate a non paper [on] possible and additional elements of [the] COC. It is meant to be more prescriptive and operational.” In other words, ASEAN members will have to meet to approve any further additions to their draft COC before meeting with Chinese senior officials. Why Was There No Joint Communiqué? The AMM has a busy agenda that extends well beyond South China Sea issues. In 2011, for example, the joint communiqué issued at the end of the 44th AMM listed 120 items and ran to twenty-nine pages. At the 45th AMM Cambodia’s Foreign Minister, Hor Namhong, assigned responsibility for drafting the joint communiqué summarizing the AMM deliberations to a working party of four foreign ministers: Marty Natalegawa (Indonesia), Anifah Aman (Malaysia), Albert del Rosario (Philippines) and Pham Binh Minh (Vietnam).31 Their 132-paragraph draft summarized the wide range of issues taken up by the AMM including the terms of reference for the ASEAN Institute of Peace and Reconciliation, the ASEAN Human Rights Declaration and the nomination of Mr. Le Luong Minh as the next Secretary General. The draft communiqué also summarized discussions on the South China Sea including the stand off at Scarborough Shoal between China and the Philippines and Vietnam’s concerns about the award of oil exploration leases by the China National Offshore Oil Company within Vietnam’s Exclusive Economic Zone (EEZ). Cambodia argues that the failure of the AMM to adopt a joint communiqué rests squarely with the Philippines and Vietnam and their insistence on including a reference to Scarborough Shoal and EEZs in the final text. According to Cambodia, the actions by the Philippines and Vietnam prevented a consensus from being reached and Cambodia had no recourse but to withhold the joint communiqué. The leaked record of the foreign ministers’ retreat held after the AMM reveals a different story. Discussion on the South China Sea took place in the plenary session under the agenda item “preparation for the upcoming ministerial meetings.” All ten foreign ministers spoke in turn with Cambodia speaking last. The Philippines opened the discussion. Foreign Secretary del Rosario stated that ASEAN should adopt a rules-based approach in resolving maritime disputes and territorial claims and adhere to international law to ensure maritime safety and maritime cooperation mechanisms. He noted that under the DOC the signatories were committed to promote a peaceful, friendly and harmonious environment in the South China Sea. He argued that recent events involved repeated intrusions into Scarborough Shoal, violating the principles of the DOC and universally recognized principles of international law, including the United Nations Convention on Law of the Sea (UNCLOS). Then they came for the Jews, ?and I didn’t speak out because I wasn’t a Jew. The Thai Foreign Minister Surapong Tovichakchaikul spoke next. He observed that the South China Sea had attracted a lot of attention. Surapong stated that after discussions with Chinese officials he concluded that they did not want this issue to affect the excellent relations between ASEAN and China. “What is important is for all parties concerned to scale down, calm things down,” he said. Myanmar’s Foreign Minister Wunna Maung Lwin spoke briefly on the South China Sea. He reiterated his country’s desire that territorial disputes be settled peacefully through dialogue and engagement. He noted the importance of the DOC and its aim to build confidence among the parties and to settle disputes by peaceful means. Myanmar fully supported the Guidelines to Implement the DOC and welcomed the proposal by ASEAN and China to undertake cooperative projects in the South China Sea. Foreign Minister K. Shanmugam opened his remarks by noting that Singapore was not a claimant state and that “specific claims have to be resolved among [the] parties concerned.” Singapore, however, had an interest in seeing that the South China Sea “must be shared by all states, claimant and non claimant,” and it was in the common interest to the maintain peace and stability in the region. Shanmugam asserted that “freedom of navigation [is] very important to all of us. Freedom of navigation can not be respected if the rule of law is not observed.” He noted that “recent developments were of special concern” because they “invoke novel interpretations of international law that could undermine the entire UNCLOS regime” and create uncertainty over the future of UNCLOS. On Scarborough Shoal, we all know it is situated in the South China Sea, and we are talking here about the South China Sea. So why should we specify the Scarborough Shoal precisely in the South China Sea. Up to now, we all know the disputes among the concerned parties [are] in Spratlys and Paracels, but we never mention these name[s] in our talks with China. We always mention only the South China Sea. On the inclusion of the wording on EEZ and continental shelf, we believe that every one is perfectly aware that the 1982 UNCLOS have precisely defined the EEZ and continental shelf, and other issues related to the sea. Why should we repeat again? In case we [do] not find a way out, Cambodia as Chair has no more recourse to deal with this issue. So the problem we are facing now is either we have compromise text, [that will] not satisf[y] everyone. If we cannot agree on [the] text, there should be no text at all. For the Joint Communiqué, countries should not try to impose [their] national position, but the common view in spirit of compromise. ASEAN-China met twice recently to discuss informally the drafting of COC. Cambodia [is] to host formal SOM on COC in near future. All the meetings are steps forward to de-escalate tension… in the South China Sea. We should not take position that may lead in creating or escalating tension in the SCS. What I propose now is in line with what my Prime Minister has proposed, that we have to work for peace, security and stability in the region. In this context, we discussed in-depth recent developments in the South China Sea, including the situation in the affected Shoal / disputed area, exclusive economic zones and continental shelves of coastal states, particularly those contrary to the provisions of the 1982 UNCLOS. In this connection, we call upon all parties to respect the universally recognized principles of international law including the 1982 UNCLOS. Further [we call] upon all the parties to resolve the disputes in accordance with universally recognized principles of international law. Indonesia’s Marty then asked the Chair to “read again the formulation.” Hor Namhong responded, “[where] we refer to [the] shoal?” He then asked if the joint communiqué should include actions contrary to UNCLOS. “UNCLOS already defines the EEZs and continental shelves, should we repeat it again?” he asked. Malaysia’s Anifah Aman declared, “It [violations] is happening. Nowhere did we mention that it [Scarborough Shoal] belongs [to one country or another]. Instead of ‘affected shoal’ we [should] put it as ‘disputed area’.” Del Rosario retorted, “There are many disputed areas in the South China Sea but not in the Scarborough Shoal. All we are saying [is] discussion in conflict areas.” Anifah Aman replied, “We are trying to find… I don’t think we can progress forward if we specifically mention an area… It reflects the united stand of ASEAN to encompass all disputed areas.” Marty Natalegawa responded, “We [Indonesia] are not one of those claimant states. We suggested earlier to use the word ‘affected shoal.’ [We are] trying to be sensitive; affected shoal [is] without prejudice to national claims. Be we can agree to [use the term] disputed area. We don’t think that this issue is impossible to resolve. We have discussed in depth the situation [in the South China Sea]. Hor Namhong stated, “I can support the disputed areas, disputed areas covers everything.” Vietnam’s Pham Binh Minh then interjected, “Disputed area, the EEZ is not a disputed area, certainly not. Some countries [try] to turn an undisputed are into a disputed area. That’s for sure [an EEZ is not a disputed area] in accordance with international law.” Minh then proposed a break for small group discussion. The notes on the discussions at the AMM Retreat end at this point. In the midst of the above recriminations, Indonesia’s Foreign Minister initiated consultations with the nine other members of ASEAN in an effort to restore unity in ASEAN ranks and commit ASEAN to a common position.60 Foreign Minister Marty conducted an intense round of shuttle diplomacy flying to five capitals (Manila, Hanoi, Bangkok, Phnom Penh and Singapore) over a two-day period (July 18-19). Marty and del Rosario agreed to a six-point proposal that Marty put to his other ASEAN counterparts. 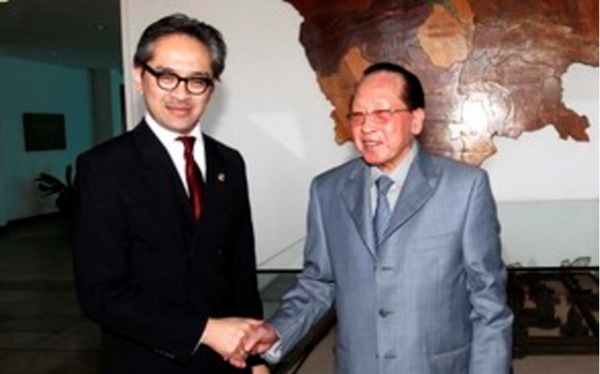 When he obtained their agreement Marty left it to Cambodia’s Hor Namhong, as ASEAN Chair, to complete the diplomatic formalities. China then dispatched its foreign minister for a fence-mending visit to Indonesia and Malaysia for talks with his counterparts. Foreign Minister Yang Jiechi stated at a joint press conference that China was willing to work with ASEAN to implement the DOC and “on the basis of consensus” to work toward the eventual adoption of the COC.63 Foreign Minister Yang held discussions with Malaysian Foreign Minister Anifah Aman in Kuala Lumpur. There was no joint press conference. Anifah Aman stated he was “confident we can resolve this matter [disputes in the South China Sea]… through peaceful means.” He then observed, [t]here are overlapping claims by member countries. Let us discuss these among ASEAN countries first before we talk to China. We can only achieve this objective in the South China Sea if all parties agree. Then China can appreciate this and realise it is ASEAN’s wish.”64 This statement seemed to imply that ASEAN-China discussions on the COC, if and when they take place, would be a protracted process. Part two provided a detailed insight into internal ASEAN dynamics as its foreign ministers discussed and debated the South China Sea question and how to word its members’ concerns in a joint communiqué. The analysis clearly demonstrates that the Philippines, as a founding member of ASEAN, expected support on an issue that touched not only on its national sovereignty but regional security as well. 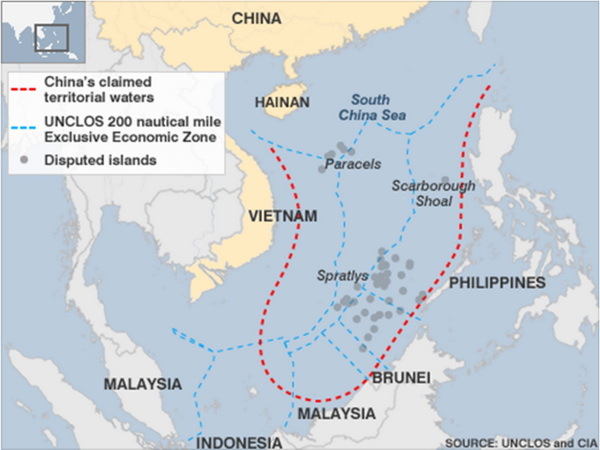 The analysis also demonstrates that there was a “majority consensus” to include reference to disputes concerning Scarborough Shoal and oil leasing in Vietnam’s Exclusive Economic Zone. The record indicates that the failure to achieve consensus was the result of Cambodia’s handling of its role as ASEAN Chair. Foreign Minister Hor Namhong was not conciliatory at the AMM Retreat and his subsequent actions in rejecting repeated attempts at compromise appear obstinate. At the same time, it is revealing that ASEAN foreign ministers acquiesced to Cambodia’s high-handedness in vetoing the draft joint communiqué drawn up by four of their colleagues. No minister directly challenged Hor Namhong’s handling of the discussion/debate at the AMM Retreat. Part three dealt with the recriminations that followed the failure of ASEAN to issue a joint communiqué. It is clear that Chinese influence played a major role in influencing Cambodia to play an obstructionist role. Cambodia’s actions indicate that the idea of an ASEAN Community played second fiddle to its relations with China. In the short run the Philippines (and Vietnam) will be hyper sensitive to Cambodia’s role as ASEAN Chair in any discussions with China on the South China Sea. In the longer term some ASEAN members will be concerned about China’s ability to influence Laos and Myanmar who will assume the ASEAN Chair in 2014 and 2015, respectively. In this respect the events at the 45th AMM may serve as a wake up call and result in amended decision-making procedures. Part four dealt with Indonesia’s decision to engage in a round of shuttle diplomacy in order to obtain unanimous agreement on ASEAN’s Six-Point Principles on the South China Sea. Foreign Minister Marty Natalegawa’s diplomatic initiative provided a much-needed boost to ASEAN morale. His efforts also helped to dispel the perception outside of Southeast Asia that there was disunity among ASEAN members on how to deal with the South China Sea issue. More importantly, Indonesia’s intervention served notice to Cambodia that as ASEAN’s chair for 2012 it could not unilaterally control ASEAN’s agenda. Natalegawa’s intervention was unprecedented in assuming a leadership role that normally would fall to the ASEAN chair and signalled that Indonesia is willing to play a more proactive role in regional affairs. Current indications are that ASEAN will pursue the implementation of the DOC and discussions on the COC with China in tandem. ASEAN will seek to obtain agreement with China on the key principles and then move on to drafting the final text. China will have to take Indonesia’s new role into account and this may prove a positive factor in addressing current tensions in the South China Sea. Carlyle A. Thayer is Emeritus Professor, The University of New South Wales at the Australian Defence Force Academy, Canberra. Recommended citation: Carlyle A. Thayer, “ASEAN’S Code of Conduct in the South China Sea: A Litmus Test for Community-Building?,” The Asia-Pacific Journal, Vol 10, Issue 34, No. 4, Auguest 20, 2012. 1 “Declaration on ASEAN Concord II (Bali Concord II),” October 7, 2003. .
2 Each of these documents was provided to the author by sources that must remain confidential. 3 Statement by the ASEAN Foreign Ministers on the Recent Developments in the South China Sea 18 March 1995. This was ASEAN’s second statement on the South China Sea in response to Chinese activities. The first was ASEAN Declaration On The South China Sea, Manila, Philippines, 22 July 1992. 4 For further background consult: Carlyle A. Thayer, “Challenges to ASEAN Cohesion: The Policy of Constructive Engagement and a Code of Conduct for the South China Sea,” Paper to international workshop on Regionalism and Globalism in Southeast Asia, Department of Political Science and International Relations, University of Tampere and the Centre for Southeast Asian Studies, Åbo Akademi University, Marienhamn, Åland, Finland, June 2-4, 2000, 31-44. 5 Association of Southeast Asian Nations, “Regional Code of Conduct in the South China Sea (Draft),” March 2000 and People’s Republic of China, “Code of Conduct on the South China Sea (Draft of the Chinese Side),” March 2000. 6 Point 10, Declaration on Conduct of Parties in the South China Sea, November 4, 2002. 7 ASEAN-China Senior Officials Meeting on the Implementation of the Declaration on the Conduct of Parties in the South China Sea, Kuala Lumpur, 7 December 2004 and Terms of Reference of the ASEAN-China Joint Working Group on the Implementation of the Declaration on the Conduct of Parties in the South China Sea; see here and here. 8 Tran Truong Thuy, “Recent Developments in the South China Sea: From Declaration to Code of Conduct,” in Tran Truong Thuy, ed., The South China Sea: Towards a Region of Peace, Security and Cooperation (Hanoi: The Gioi Publishers, 2011), 104. 9 Guidelines to Implement the DOC. 10 Carlyle A. Thayer, “Sovereignty Disputes in the South China Sea: Diplomacy, Legal Regimes and Realpolitik,” Presentation to International Conference on Topical Regional Security Issues in East Asia, co-sponsored by the Faculty of Asian and African Studies and the Ho Chi Minh Institute, St. Petersburg State University, St. Petersburg, Russian Federation, April 6-7, 2012, 7. 11 Part IX of UNCLOS is headed Enclosed or Semi-Enclosed Seas. It contains two articles, Article 122 (definition) and Article 123 (cooperation of states bordering enclosed or semi-enclose seas). 12 Carlyle A. Thayer, “Is the Philippines an Orphan?” The Diplomat, May 2, 2012. 14 Estrella Torres, “Manila tack on China row wins Asean nod,” Business Mirror, July 13, 2012. 16 Ian Storey argues that the inclusion of the words “comprehensive and durable” settlement of the dispute represented a partial victory for Vietnam and the Philippines and a rejection of Deng Xiaoping’s proposal to “shelve sovereignty disputes and engage in joint exploration.” In fact the words “comprehensive and durable” were first used in the 2002 Declaration on Conduct of Parties in the South China Sea, Point 6, which China signed. See: “Ian Storey Comments,” The Nelson Report, July 31, 2012. 17 A comparison of the two drafts does not support the conclusion reached by Storey that “the language was watered down.” See: “Ian Storey Comments,” The Nelson Report, July 31, 2012. 19 Instrument of Accession to the Treaty of Amity and Cooperation in Southeast Asia, October 8, 2003. 20 United Nations Commission on Law of the Sea, Annex VI, International Tribunal for the Law of the Sea. See also UNCLOS, Part XI,The Area, Section 5, Settlement of Dispures and Advisory Opinions, Articles 186-191 and Part XV, Settlement of Disputes, Articles 279-299. 21 Summary of Cambodia Chair’s intervention at the AMM Retreat, 9 July 2012, 1 and 25. 22 “Divisions serve to weaken ASEAN,” The Japan Times, July 21, 2012. A Chinese Foreign Ministry spokesperson stated that on July 8 the ASEAN-China SOM agreed to carry out the DOC “in a comprehensive and effective manner, as well as carry out cooperation projects under the DOC framework…”; “China expects co-op on South Chins Sea,” China Daily, Juy 10, 2012. 23 Summary of Cambodia Chair’s intervention at the AMM Retreat, 9 July 2012, 25 and Channel News Asia, “Element of confidence building between ASEAN and China,” July 10, 2012. 24 Scott Stearns, “China Ready to Join South China Sea Talks,” Voice of America July 12, 2012. 25 According to Surwin, “They [the senior officials] have to decide in the next day or two whether this process is going to be formalized with certain specific schedule. Is this going to be needed in the future when we discuss whenever we come together, or are we going to have a regular schedule of meetings between both sides?” Channel New Asia, “Element of confidence building between ASEAN and China,” July 10, 2012 and Agence France-Presse, “Asean reaches out to Beijing over sea code,” Gulf Times, July 10, 2012. 26 “Divisions serve to weaken ASEAN,” The Japan Times, July 21, 2012. 27 “Ian Storey Comments,” The Nelson Report, July 31, 2012. Storey used more guarded language in earlier accounts where he wrote that Foreign Minister Yang “seems to have ruled out” the September meeting on a code of conduct until “when time was ripe.” Storey’s interpretation may be a misreading of China’s position as it has used the expression “when conditions are ripe (or mature)” well before the 45th AMM. A Chinese spokesperson also used this expression on July 9 two days before Yang spoke. See: Lipin, “Cambodia Says ASEAN Ministers Agree to ‘Key Elements’ of Sea Code” and Ian Storey, “Little hope of South China Sea Code of Conduct,” South China Morning Post, July 27, 2012; Storey, “China Pushes on the South China Sea, ASEAN Unity Collapses,”China Brief, XII(15), August 4, 2012, 8-11; and Storey, “China bares claws in maritime dispute,” Asia Times Online, August 8, 2012. 28 The ASEAN-related meetings included: the ASEAN Post-Ministerial Conference with dialogue partners, the 19th ASEAN Regional Forum, ASEAN Plus 3 Foreign Ministers Meeting and the 2nd East Asia Summit Foreign Ministers Meeting. 29 “Opening Address By Samdech Akka Moha Sena Padei Techo HUN SEN Prime Minister of the Kingdom of Cambodia At the Opening of the 45th ASEAN Foreign Ministers’ Meeting,” Phnom Penh, 9 July 2012. 30 Martin Abbugao, Australian Associated Press, “ASEAN pushed on South China Sea code,” Herald Sun, July 9, 2012 and Agence France-Presse (AFP), “Hun calls for ASEAN South China Sea code,” The Australian, July 10, 2012. 31 Ernest Z. Bower, “China Reveals Its Hand on ASEAN in Phnom Penh,” Southeast Asia from the Corner of 18th and K Streets, vol. III, No. 14, July 19, 2012, 2. 32 Cambodia, Ministry of Foreign Affairs, “The Forty-fifth ASEAN Foreign Ministers’ Meeting,” Media Advisory, July 6, 2012. 33 This is an allusion to an agreement by the Philippines and China to simultaneously withdraw their vessels from Scarborough Shoal and for China to remove its barrier from the entrance to the shoal. The Philippines withdrew its vessel on June 4 but China did not reciprocate. Erlinda F. Basilio, “Why there Was No ASEAN Joint Communiqué,” Republic of the Philippines, Department of Foreign Affairs, Public Information Services Unit, July 19, 2012; and Erlinda Basilio, “What happened in Phnom Penh?” The Philippine Star, July 19, 2012. 34 This is a reference to consultations between the Philippines and other ASEAN members that resulted in the drafting of this statement on May 24. On the following day Secretary for Foreign Affairs del Rosario wrote to the ASEAN Chair requesting that the statement be referred to all ASEAN foreign ministers for consideration. See: Basilio, “Why there Was No ASEAN Joint Communiqué” and Basilio, “What happened in Phnom Penh?.” According to Cambodia’s Ambassador to the Philippines, “Cambodia, as ASEAN Chair, wrote to all ASEAN Foreign Ministers to ask for responses in writing on this issue. But, after waiting for several weeks, it was clear that ASEAN had no consensus on this matter of Scarborough Shoal. Therefore, no one could blame Cambodia for not issuing the ASEAN statement…” See: Ambassador Hos Sereythonh, Letter to Ms. Ana Marie Pamintuan, Editor-in-Chief, The Philippines Star, July 26, 2012. 35 China announced a three billion yuan (US $476 million) Maritime Cooperation Fund at the 2011 East Asia Summit to finance cooperative activities under the DOC. 36 This is a reference to China’s proposal to form an Eminent Persons and Experts Working Group (EPEWG) comprised of ten members, five from China and five from ASEAN, to discuss the draft COC. China later agreed to a fifteen-member EPEG, ten from ASEAN and five from China. ASEAN reportedly insisted that the EPEWG should be formed only after negotiations on the COC had commenced. See: Don Emmerson, “ASEAN Stumbles in Phnom Penh,” Asia Times Online, July 17, 2012 Extracts were published in Emmerson, “ASEAN Stumbles in Phnom Penh,” PacNet #45, July 19, 2012 and “ASEAN Stumbles in Phnom Penh,” East Asia Forum, July 23, 2012. 37 The 5th ASEAN-China Senior Officials’ Meeting on the DOC and the 7th ASEAN-China Joint Working Group on the Implementation of the DOC met in Beijing from January 13-16, 2012. 38 Cambodia’s Ambassador to the Philippines claimed that “eight out of ten ASEAN Member States agreed to all 132 points in the Joint Communique of he AMM, including the three paragraphs (14, 15, 17) related to the South China Sea, except paragraph 6 which is the bilateral disputes between the Philippines and China and Vietnam and China…” See: Ambassador Hos Sereythonh, Letter to Ms. Ana Marie Pamintuan, Editor-in-Chief, The Philippines Star, July 26, 2012. 39 Summary of Cambodia Chair’s intervention at the AMM Retreat, 9 July 2012, 1. The second part of this document records Hor Namhong as stating, “If you cannot agree on the text of the joint communique we have no more recourse to deal with this issue as the Chair of ASEAN,” 28. 40 Zsombor Peter and Kuch Naren, “Cambodia Criticized for Asean Meeting Failure,” The Cambodian Daily, July 14-15, 2012. 42 Greg Torode, “ASEAN Left on a Knife Edge,” South China Morning Post, July 21, 2012. 43 Jane Perlez, “Asian Leaders at Regional Meeting Fail to Resolve Disputes Over South China Sea,” The New York Times, July 12, 2012. 45 Zsombor Peter and Kuch Naren, “Cambodia Criticized for Asean Meeting Failure,” and Prak Chan Thul and Stuart Grudgings, “SE Asia meeting in disarray over sea dispute with China,” Reuters, July 13, 2012. 47 Jane Perlez, “Asian Leaders at Regional Meeting Fail to Resolve Disputes Over South China Sea,” The New York Times, July 12, 2012. 48 Roger Mitton, “ASEAN Struggles for unity,” The Phnom Penh Post, July 23, 2012. 49 David Boyle, “Goverment fires back on South China Sea,” The Phnom Penh Post, July 31, 2012. 50 Koy Kuong, Letter to Mr. Kevin Doyle, Editor-in-Chief, The Cambodian Daily, July 26, 2012. 52 Ambassador You Ay, Letter to Mr. Pichai Chuensuksawadi, Edior in Chief of the Bangkok Post, July 27, 2012. 53 Ambassador Hos Sereythonh, Letter to Ms. Ana Marie Pamintuan, Editor-in-Chief, The Philippines Star, July 26, 2012. 54 See note 24 above. 55 Michael del Callar, “DFA demands explanation from Cambodian envoy for caustic remarks,” GMA News, July 31, 2012; and “Cambodia envoy still a no-show,” ABS-CBN News, August 2, 2012. 56 Carlyle A. Thayer, “Cambodia-Philippine Diplomatic Tiff Continues,” Thayer Consultancy Background Brief, August 7, 2012. 57 Kishore Mahbubani, “Is China Losing the Diplomatic Plot?” Project Syndicate, July 26, 2012. 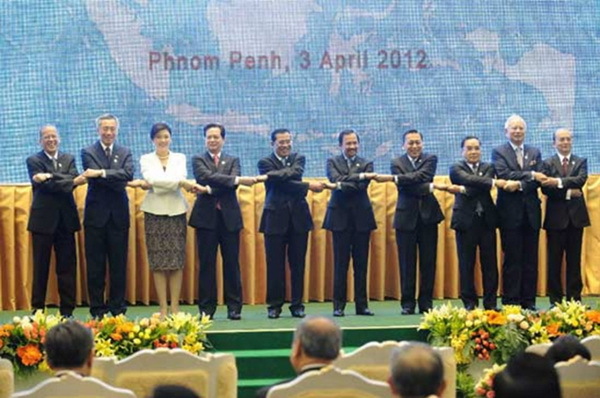 58 Amitav Acharya, “The end of ASEAN centrality?,” Asia Times Online, August 8, 2012. 59 Chen Xiangyang, China Institutes of Contemporary International Relations, quoted by Kathirn Halle, “Bejing considers stronger foreign ties,” The Financial Times, August 15, 2012. 60 Carlyle A. Thayer, “ASEAN Unity Restored by Shuttle Diplomacy?” Thayer Consultancy Background Brief, July 24, 2012. 61 Statement of ASEAN Foreign Ministers on ASEAN’s Six-Point Principles on the South China Sea, July 20, 2012. Cambodia’s Foreign Minister could not resist using this occasion to lay the blame for ASEAN’s failure to issue a joint communiqué on Vietnam and the Philippines. 62 Statement by Spokesperson Qin Gang of the Ministry of Foreign Affairs of China on the US State Department issuing a So-called Press Statement on the South China Sea, August 4, 2012. I am grateful to Greg Torode of the South China Morning Post for pointing out the significance of this statement. 63 Tarra Quismundo, “China says it’s willing to ease Asean rift on sea,” Philippines Daily Inquirer, August 11, 2012. 64 Agence France-Presse, “Malaysia urges ASEAN to unite over South China Sea,” August 12, 2012. 65 ASEAN Political-Security Community Blueprint (Jakarta: ASEAN Secretariat, June 2009), 7. 66 Charter of the Association of Southeast Asian Nations, Novemer 20, 2007, 5.